Despite receiving heaps of praise, Nintendo should tweak its celebrated kart racing series. Nintendo's Mario Kart 7 is mere days from release, and while we think quite highly of the game (read our review), a handful of minor issues left us wanting even more. 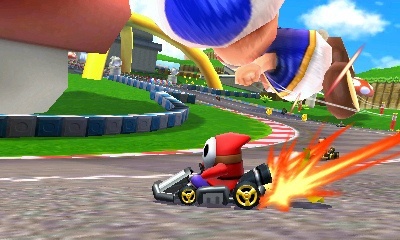 Some are specific to Mario Kart 7, while others have cropped up in previous games. With this in mind, here's a short list of things we'd like fixed and improved upon. The infamous Blue Shell, from our experience, is unstoppable, and it's been this way for years. Why is that? Although Mario Kart games encourage parity, the notion that even the person in last place can win, it's about time the developers create a rare counter item that allows those in first to brush aside the blue menace and remain on top. There's no guarantee that the Mario Kart 7 hang gliders will reappear in Mario Kart 8. After all, Nintendo chose to leave the two characters per kart feature in Mario Kart: Double Dash!! on GameCube. If they make the jump, though, we'd appreciate more time in the air. The flying segments in Mario Kart 7 last a few seconds at best. Mario Kart games are much slower than other arcade style racers for good reason. A tiny kart cannot compete with a Ferrari. That said, Mario Kart 7 is at its best when players use Mushrooms for an added speed boost, which automatically provide bigger thrills. With this in mind, Nintendo would be wise to kick up the pace a couple notches, instead of forcing gamers to slowly putter along. We love creating our own karts, swapping out bodies, wheels and gliders, but let's face it, this is as simple as it gets. What happened to the custom logo feature in Mario Kart DS? Why can't we change colors? Clearly, there's more Nintendo can do.